Hermine entered the Marist Missionary Sisters in Bedford, Massachusetts on September 8th, 1933. 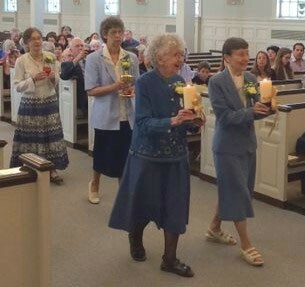 She made her first vows on September 8th, 1936 and then did community service in both Bedford and Boston. She made her perpetual vows four years later (on September 8th) just before departing for the missions on September 17th, 1940. She arrived at Villa Maria, in Sydney, Australia on November 1st, 1940. 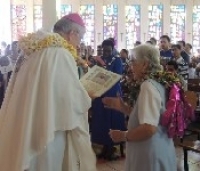 During the Second World War, it was not possible for the Sisters to travel to their Pacific island destinations, and Sr. Hermine was to remain in Australia for more than five years. After assisting in the kitchen at Villa Maria in Sydney, Sr. Hermine did her teacher training at Singleton from 1941-43, and received a Certificate for Elementary Teaching. She taught for a year in Sydney, and then went on to Waratah, Australia, where she did a nursing course from 1944-46. As many Sisters were expected to do both teaching and nursing in isolated missions in the Pacific, she was well prepared. Sister finally arrived in the Solomon Islands in April of 1946, less than a year after the end of the war in the Pacific. 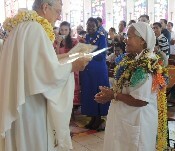 Over the next ten years, Sr. Hermine served as both nurse and teacher in Visale, Tangarare, Buma, Rokera, and Wainoni Bay. 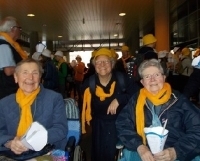 In 1956 Sr. Hermine was called back to the USA to participate in the “Second Novitiate” in Framingham, Massachusetts. Afterwards she remained in Framingham, which was then our central house, to do community service. In 1962 she was transferred to Bedford, shortly before our novitiate was relocated from there to Waltham. In Bedford, and later in Waltham (1966-68), Sr. Hermine did community service as well as catechetical work in the local parishes. In 1968, Sr. Hermine volunteered to go to Holland to be with one of our sisters who was alone there and ill. While there Sr. Hermine served as a nurse assistant at the Winssen Nursing Home. 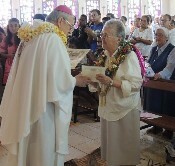 Returning to the USA in 1971, Sr. Hermine was soon missioned to Hawaii, where our Sisters did the domestic work at St Stephen’s Seminary in Kaneohe. In 1973 she returned to Massachusetts and began her long association with Maristhill Nursing home. For several years she was a full-time nursing assistant there. In 1990, Sr. Hermine was back in Waltham at the Grove Street community, and continued as a volunteer at Maristhill, as well as giving community service and volunteering as a Eucharistic minister in the parish. As her age and infirmities increased, Sr. Hermine moved to the Marillac Residence in Wellesley Hills, in 2005. As long as she was able, she was a regular visitor to the sick in the Elizabeth Seton Residence, the nursing home section next-door. Finally, in October 2014 she returned to Maristhill Nursing Home, where she has served for so long, but this time as a resident. She died there peacefully on the afternoon of May 13th, 2016. 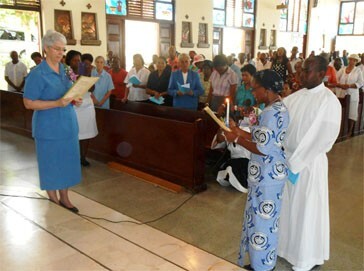 Sister Hermine, you have given us such a wonderful example of a life of constant and gracious service to others “in the spirit of Mary”. May you enter now into the joy of Jesus and Mary, and of all the loved ones who have gone before you.